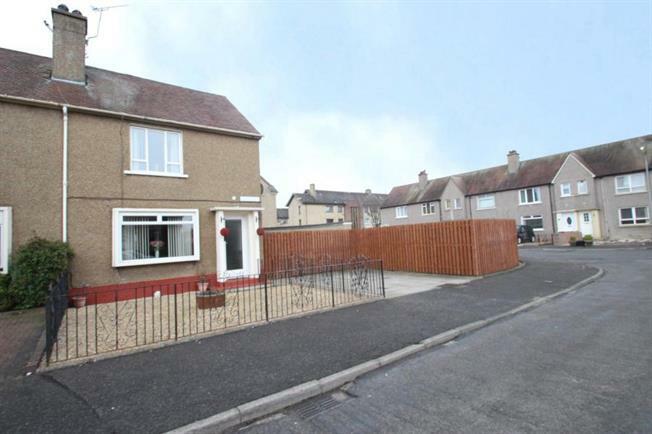 2 Bedroom End of Terrace For Sale in Grangemouth for Offers Over £90,000. Well proportioned and well presented, two bedroom end terraced villa on a fine corner plot close to local amenities, with driveway large ground to the side and rear. This attractive family home comes complete with entrance vestibule with stairs to the upper floor, bright formal lounge, attractive modern fitted kitchen complete with integrated hob, oven and extractor, with back door to rear gardens. On the upper level there is a three piece gamily bathroom and two double bedrooms both with storage cupboards. In addition the property has electric heating and double-glazing as well as partially floored and lined loft. Externally, there a large private gardens to the side and rear that are mainly to lawn, slabbed patio, shed and is fully enclosed by a time fence. Viewing is recommended and is strictly by appointment through the Falkirk branch of Slater Hogg & Howison. Grangemouth proves popular with commuters seeking access via surrounding road and motorway networks to centres of business throughout the central belt and two main line rail links provide express services to both Glasgow and Edinburgh.